The facade of the milk bar in Murrayville in the Sunraysia region of Victoria, Australia. Cowangie is a tiny hamlet in the Sunraysia region of far north western Victoria, Australia. One of the bands with which I’m currently involved, Murder Of Crows, played a gig there recently. It was a hoot and the local crowd were outstanding. The same can be said for the small group of friends and family that made the trip to the gig, some from interstate. As I was gainfully employed (i.e., on stage), I wasn’t able to make any photographs during the event. However I did make a few images the night before the gig and also on the day of the event. Cowangie is situated 510km from Melbourne. That’s a pretty decent drive in anyone’s book. Fortunately we were blessed with great weather throughout the weekend. Clear, sunny skies with barely a breath of wind and temperatures in the mid twenties (celsius). That’s a far cry from the weather we’ve had over recent months in Melbourne. It’s been a long, cold and drab winter, though it’s certainly improved over the last few weeks. Apparently it’s been an unusually long, grey and cold winter in Cowangie as well. The fact that we arrived along with spectacular weather seemed like a good omen. We played a gig in Cow during the middle of winter 2014 when most of the band were terrible ill with the flu. I got it the day before we left Melbourne and was really under the weather during our stay. But I didn’t have to sing. How our singer, Sue, got through that night is a mystery. In fact it’s a double mystery because, once again, Sue had the flu again this time around. Not that the audience could tell. Susie’s performance was stellar, as our last song, Whole Lotta Love by Led Zeppelin, testified. I always feel a need to make photographs when I travel. The desire to employ photography to tell a story can also be strong. Most of us stayed in Murrayville, at 444 people a town somewhat larger than Cowangie. I arrived around sunset and took my camera out for a few minutes on a short walk around town. The photo of the closed milk bar tells the story of what happens in small towns as folks move off to the big city for education and employment. Businesses, schools and sporting organizations close and passenger trains no longer run. This can be the death of rural communities. Fortunately both Cowangie and Murrayville seem to be fighting back and, despite the difficulty associated with living in such an isolated part of the state, these communites seems determined and strong. The vintage appearance of the local garage at Murrayville in the Sunraysia region of Australia at dusk. After photographing the front of the milk bar I walked around the block, harassed by dogs, to discover this old garage. It looks like it’s still an ongoing concern, though the old fuel pumps out the front echo times long gone. Sunset casting a soft, warm light on the now abandoned Murrayville Railway Station in the Sunraysia region of Australia. The last light of the day illuminated the Murrayville Railway Station. Once a stop on the Adelaide line, this lovely little station is but a memory of this once important transport link between town and city. I wanted to photograph the distant silo, but was too close to those malicious mongrels. I don’t think they were going to bite me, but they made such an almighty noise that I felt I needed to retreat or have the beauty of the day’s last light lost to the raucous racket from these hounds of hell. Their owner called them inside, but they continued barking so loudly that I decided to approach the silos from the other side. By the time I’d got there the sun had well and truly set. Fortunately there was just enough light from the afterglow that I was able to make this photograph at day’s end. The light of the afterglow illuminates the tracks at the Murrayville Railway Station in the Sunraysia region of Australia. While a cliche, the transition of color in the sky is attractive and the silo, as a silhouette, evocative. Most of all it’s the light on the train tracks that drew my attention and the reason they feature so prominently in the composition. Steve Geohegan, bass player extraordinaire with the Murder Of Crows, strikes a reflective chord playing an accoustic guitar by campfire light at Murrayville, Australia. Later that night the band got together for a chat and a sign-a-long by the campfire. It was a great fire, fueled by red gum. The photo above depicts our bass man, Steve, who’s also a great acoustic player. It was a simple matter of moving around so that the firelight produced, in this case, a strong side lit effect on Steve’s face. Due to the very high levels of noise (i.e., interference) evident in the camera's EVF (i.e., Electronic Viewfinder) composition and critical focusing is difficult under very low levels of illumination such as what was provided by the campfire. Faces in the fire provide an alternate view of a camp fire at Murrayville in the Sunraysia region of Australia. There’s something compelling and totally engaging about a campfire. The flames flicker, dance and throw warm light against the surrounding darkness, both attracting and lulling our attention. I find gazing at fires to be a very meditative experience and a great way by which we can switch our otherwise busy minds off and tune into the reality of the now. And let's not forget faces in the fire. But it’s not easy making photos in the dark, particularly with a new camera. I’ve had the Sony a7Rii camera for a while now and was beginning to feel quite comfortable with it. Then I stopped using it for a few weeks and, well, I was all thumbs again when it came to making these photos. It was a good reminder of the fact that perfection comes out of continued practice (my fellow band members will, no doubt, find that an ironic statement given the fact that, when it comes to the guitar, that’s something I don’t actually do) and, with my upcoming photography adventure to New Zealand, I need to do a whole lot more practice over the next few weeks. Silos are the closest thing to a skyscraper you'll see in rural hamlets like Cowangie in the Sunraysia region of north west Victoria, Australia. This particular silo, located between the towns of Murrayville and Cowangie, drew my attention. I was out and about exploring on the day of the gig. I’d slept very, very late as life had been extremely hectic over recent months and I wanted to be in good form for my friends in the band, and the audience, later than night. After lunch I drove around and explored the town of Pinnaroo over the border in South Australia, prior to heading back to Cowangie. When it came to photographing this particular silo I opted for a traditional black and white rendering with warm whites reminiscent of the look of Agfa Record Rapid paper from days gone by. (That’s for my good friend, and lead guitarist in the band, Bruce Bunn who worked for Agfa back in the day). It’s an image that relies on structure and a few examples of leading lines to bring the viewer into and up through the frame. I think the warm tone adds to the nostalgic feel associated with this kind of subject matter. Several members of the band, Marguerite and Gary, are related and came from Cowangie and the surrounding area. I made this photo shortly before the band’s sound check. 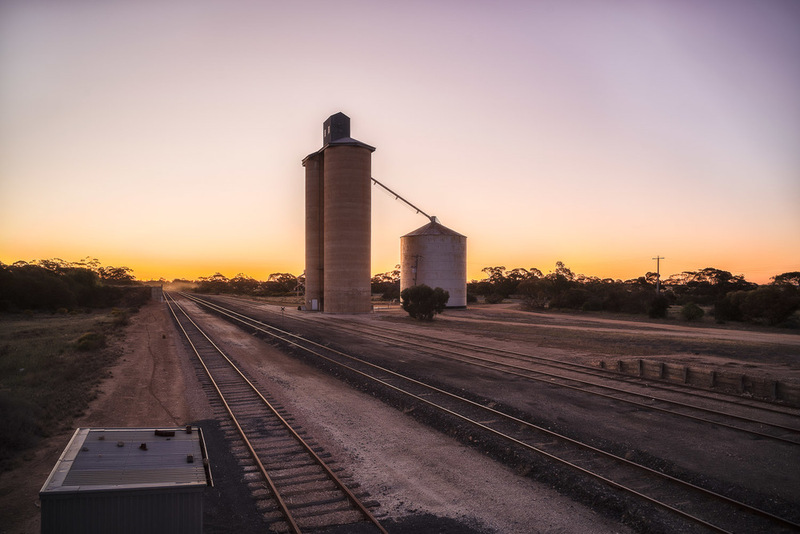 I was aware that sunset was approaching so I ducked out of the lovely Cowangie Soldier’s Memorial Hall and headed down the street to this view overlooking the train tracks and the silos at Cow. It wasn’t the most spectacular sunset, but the quiet of that time of day was, nonetheless, compelling. Silos are a kind of modernist architecture, where form follows function. They serve an important function, but they are also beautiful in their own right. The silos at Cow are not the Sydney Opera House but, in the right light, they’re not bad either. These images are important on several levels. They depict, what for city slickers may be considered as an exotic location, while for Marguerite and Gary I hope the photos bring back memories of home, back on the farm. The afterglow provides a soft, delicate quality of light to this scene over looking train lines and silos at Cowangie, Australia. I’m also a country boy at heart, growing up in Hamilton, the self-proclaimed wool capital of the world, which is a small town in Western Victoria. I may well move back to the country in years to come. The city’s only good if you work there and actually make the effort to enjoy what it offers. Now that so much of my work is done online I’m very attracted to moving to one or more locations that offer a superior lifestyle in addition to a fantastic internet connection. I expect to be spending at least several months doing just that next year. Glenn Guy: Acoustic Guitar. (I don't brew the tea, I just stir it occasionally).